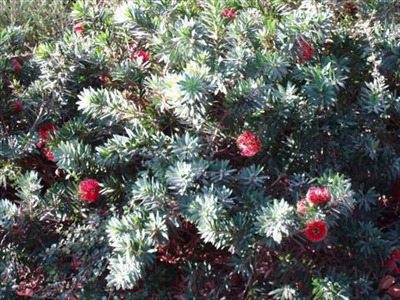 Low growing shrub with narrow grey-green leaves and bright red flowers in summer-winter. Grows well in most soils and situations. Tolerant of frost and extended dry periods once established. Growing well coastal or inland areas - Santa Barbara -Ojai-Pasadena to Florida. Great for attracting hummingbirds and as a low screen.